I am an expert at procrastinating and I’ve done it about this blog for far too long. I have actually been quite busy, with cycling, erm, cycling and some other cycling related stuff; but that is no excuse. I find myself in conversations about the food I eat and the way I exercise almost every day; some people agree with my points of view, some don’t. What I do know is that the people who I recommend to try cutting the carbs and eating real food lose weight quite easily and feel great. They pack on lean muscle and do better in the gym and on the bike. I’ve reaffirmed the need I have for an outlet about my low-carb and cycling musings and I intend to get back to this blog and share some (hopefully) interesting nutrition and cycling related information. In February I took a cycling physiology test and it turns out my numbers were pretty decent for a carbohydrate avoider. 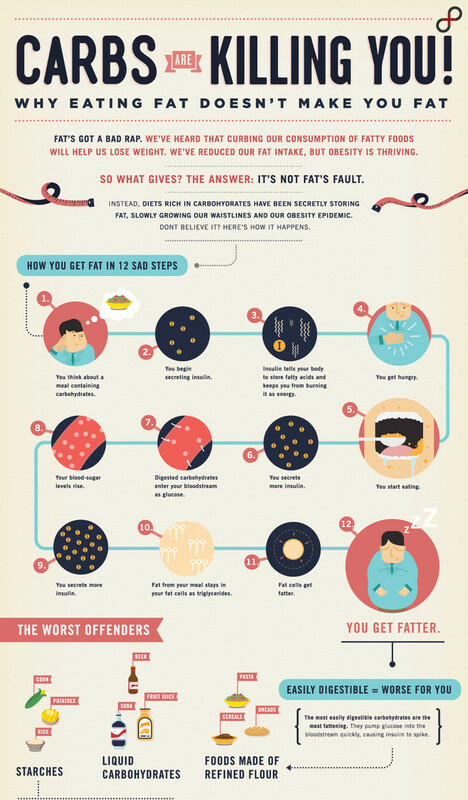 Or maybe they were decent BECAUSE I’m a carbohydrate avoider… The University later contacted me and asked if I’d like to take part in a study they are carrying out about muscle gene expression. Being a science geek I jumped at the chance and will be having little lumps taken out of my thigh muscles after sprinting like a nutter for two minutes. I had a tangle with a car which ended up with me injuring my knees and needing a new front wheel for my Langster. I was off the bike for a couple of weeks, but have returned with a vengeance. I’ve experimented with supplementation, primarily with magnesium, to try to deal with the killer migraines that I get about once a month. I’ve had some success and will post about my experience. I’ve ordered some vitamin D3 and fish oil tablets and will be self-experimenting with them over the next few months. I’ve nailed some primal recipes which I’ll be posting soon, including my best chilli con carne recipe and a fantastic rogan josh-esque curry that I whipped up last night. I’m even trying to conquer my procrastination. 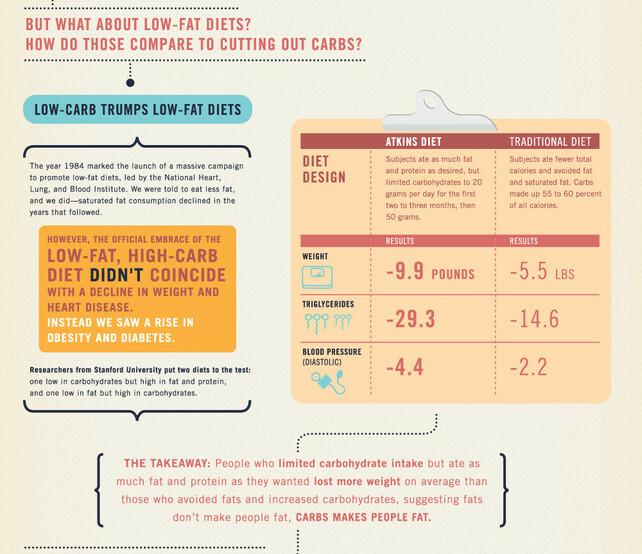 When making low-fat food, it is usually easy for the non-dieting guest to detect that fat and sugar have been omitted. A polite acknowledgement to the chef is usually made, but in my experience the food is usually bland and unfulfilling. When I served up these biscuits at Christmas, family members could not believe that they were our ‘diet’ food. Of course, to a person who consumes a high carbohydrate diet and has the subsequent high insulin level, these biscuits might contribute to weight gain. For those of us who have our insulin under control, the high fat and moderate carbohydrate content will pose no such problems and give a tasty boost during longer bike rides. 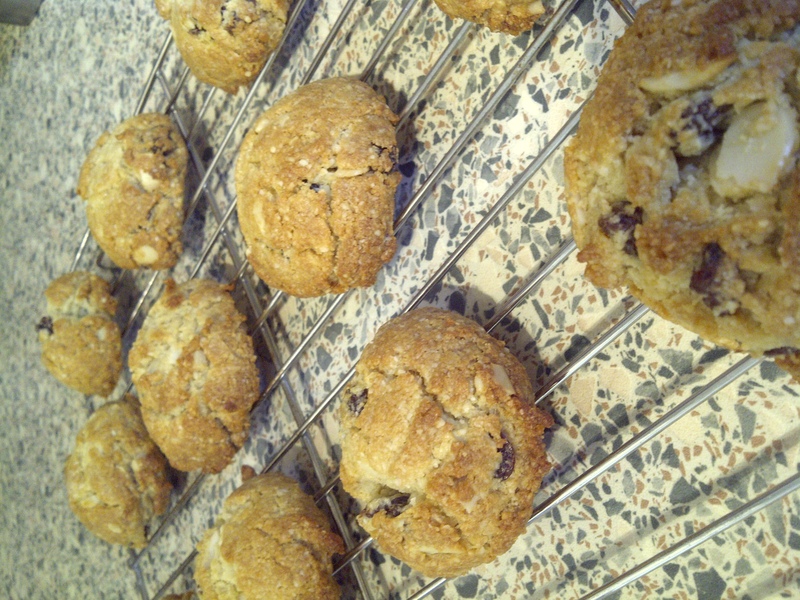 Adapted and from two sources (Mark’s Daily Apple and This Primal Life) , I have a basic recipe for the biscuits, which I embellish as my mood takes me and store cupboard allows. For energy bars, I form the biscuit ‘dough’ into bar shapes which I wrap in cling film and put in the pocket of my jersey or food pack on the top tube of my bike. For biscuits, I make rounds or just dollop the mixture on to the baking tray with a tablespoon. The biscuits are energy dense, and one is satisfying enough with a cuppa, although I can get through 3 or 4 bars on an epic ride. Put these ingredients in a bowl and give them a mix. To this mixture, add the other dry ingredients that you have decided to use, such as roughly chopped nuts, coconut flakes, chopped dark chocolate, cocoa powder, a small amount of non-sweetened dried fruit (I dry my own blueberries) or some spice, such as dried cinnamon or ginger. Heat the wet ingredients in a small pan until the fat has melted. Stir the wet mixture into the dry to form a biscuit ‘dough’. If the mixture is very wet, add more ground almonds. If it is dry, add a little water. Mix and cool a little if you have added chocolate to enable it to stay in defined lumps when baked. Form the mixture into your desired shape and place on some baking parchment and bake in the oven at 180C for 10-12 minutes until slightly golden. Cool on a rack. Primal humans ate as much of a beast as they could, cooking and processing food to make it easier to digest possibly even further back into our evolutionary history than we have traditionally thought. Some cultures still do, famously the Chinese. I have always been an experimental carnivore and relish scoffing new and exciting animals. I have often wandered around zoos contemplating the taste of one animal or another imagining I’m following in Darwin’s footsteps. Preparing some smoked haddock for a fish pie this evening, I caught myself walking to the bin with their incredibly fragrant skins, skins with a good bit of flesh still attached. It occurred to me that I should freeze them for stock. An even better thought then popped into my head: ‘Fried, crispy fish skin’. 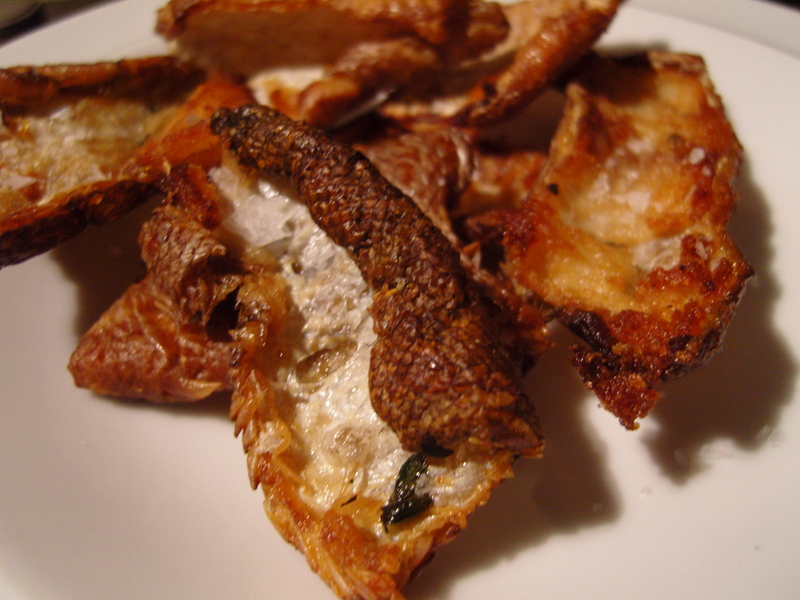 Crispy fish skin is often seen on the menus of swanky restaurants, and for a good reason. As well as being delicious, it’s profitable due to the usual place fish skins end up. The bin. I snapped the bin lid closed and in 10 minutes, with the help of some hot olive oil and a sprinkling of sea salt, transformed the skins into a fantastic cook’s treat. I cut the skins into squarish pieces of about 2 inches and put about half an inch of oil into a pan, heated it and dropped the skins in. They shrivelled up when they hit the oil, but relaxed out again after a few seconds. They fried for a minute or two in the oil, until golden, and then drained on a piece of kitchen paper and sprinkled with some sea salt flakes. Potato crisps are one of my cheat foods. I’m not talking about the tasteless, uniformly beige things, laden with overpowering flavouring, but a good, earthy bag of thicker cut artisan crisps. The fish skin scratched the same itch I have for crisps and qualifies as primal food. They are like fishy pork scratchings. Crunch! If you are trying to find me tomorrow, I’ll be at the fish market hunter-gathering in the bins. Ahh, crumble. Homely, satisfying and great for a January treat. 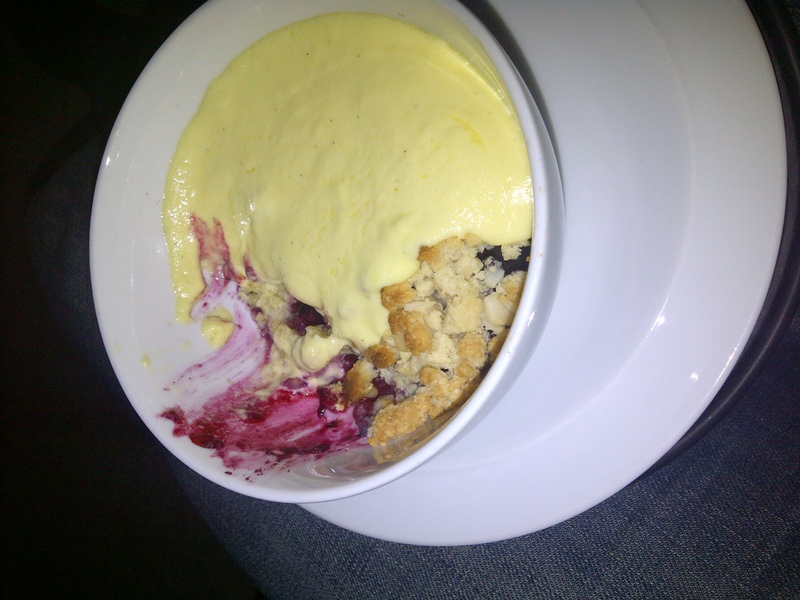 I’d been thinking about making a primal crumble with custard for a while and suddenly had the inspiration to give it a go. I was happy with my effort; sweet/tart cherries, crumbly topping and creamy custard. Any other frozen berries would be good and gathered blackberries would be sublime. I split the crumbles into two separate bowls so scale up or down as required. 1. Put the oven on to heat at around 180C. 2. In a mixing bowl, mix the almond flour and chopped nuts. Put the butter and maple syrup into the bowl and twiddle the mixture between your fingers to create a crumble. It’s not quite the same consistency as when using flour and my mixture had quite a few bigger blobs of buttery almond flour, so I cut the amount down a little for this recipe. This didn’t really affect the final crumble ‘mouth-feel’. 3. Put a handful of the cherries into an oven proof bowl and cover with a layer or the crumble mixture. Place in the centre of the oven for about 20 minutes until the crumble has browned a little and the cherries have defrosted, cooked and gone a little syrupy. 4. Meanwhile, put the cream into a small pan with the scraped vanilla seeds or extract and heat gently. Whisk in the egg yolks and keep whisking until the custard is thicker in texture. Be careful here as it’s easy to heat too fast and scramble your eggs. If this happens, add a little water to cool the mixture down a bit and whisk harder. Turn the heat off when the custard goes as custardy as you like it. 5. Pour the custard on top and tuck in!